PESHAWAR, Pakistan, Oct 12 2014 (IPS) - For girls living in northern Pakistan’s sprawling tribal regions, the struggle for education began long before that fateful day when members of the Taliban shot a 15-year-old schoolgirl in the head, and will undoubtedly continue for many years to come. Still, the news that Malala Yousafzai – a former resident of the Swat Valley in the northern Khyber Pakhtunkhwa (KP) province – had received the Nobel Peace Prize on Oct. 10, brought renewed vigor to those battling the Taliban’s hard-line attitude towards girls’ education. Residents here told IPS that when she survived an attempt on her life on Oct. 9, 2012, Yousafzai became an icon, a representative of the state of terror that has become a part of everyday existence here. “We appeal to Malala to spend funds to promote education in FATA." -- Yasmeen Bibi, a 13-year-old refugee who is not attending school. By awarding her the world’s most prestigious peace prize, experts say, the Nobel Committee is sending a strong message to all who remain trapped in zones where the sanctity of education has been subordinated to the perils of conflict. “It will be a motivational force for parents to send their daughters back to school,” he added. Since militants began crossing the Afghan-Pakistan border in 2001, following the U.S. invasion and occupation of Afghanistan, residents of these mountainous areas have endured the full force of extremist campaigns to impose strict Islamic rule over the population. At the height of the Taliban’s rule over the Swat Valley, between 2007 and 2009, approximately 224 schools were destroyed, stripping over 100,000 children of a decent education. It was during this period that Yousafzai, just 12 years old at the time, began recording the hardships she faced as a young girl in search of an education, writing regular reports for the Urdu service of the BBC from her hometown of Swat. Her struggle found echo all around northern Pakistan, where hundreds of thousands of young people like herself were living in constant fear of reprisals for daring to pursue their studies. In the Federally Administered Tribal Areas (FATA), for instance, Taliban edicts banning secular schools as a “ploy” by the West to undermine Islam have kept 50 percent of school aged children out of the classroom. 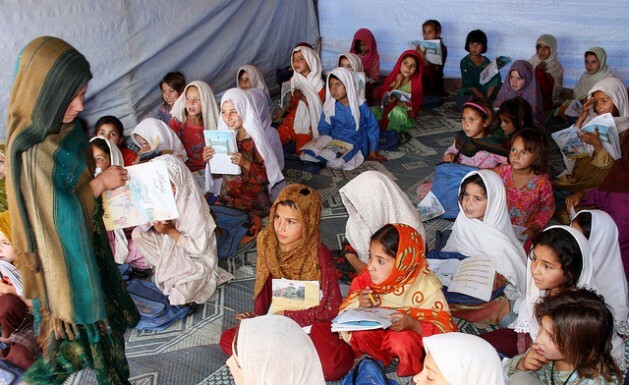 Since the decade beginning in 2004, the Taliban have damaged some 750 schools, 422 of them dedicated exclusively to girls, according to a source within the FATA directorate for education. FATA has one of the lowest enrollment rates in the country, with just 33 percent of school-aged children receiving an education. In total, about 518,000 children in FATA are sitting idle, as per government records. The dropout rate touched 73 percent between 2007 and 2013, as families fled from one district to another to escape the Taliban. The latest wave of displacement has seen close to one million people from North Waziristan Agency evacuating their homes since Jun. 15 and taking refuge in Bannu, an ancient city in KP. Schoolgirls at a demonstration in Peshawar in support of Malala Yousafzai. Credit: Ashfaq Yusufzai/IPS. A rapid assessment report released by the United Nations in August found that 98.7 percent of displaced girls and 97.9 percent of the boys were not receiving any kind of education in the camps. Already nursing a miserable primary school enrollment rate of 37 percent, Bannu is on the verge of a full-blown educational crisis, with 80 percent of its school buildings now occupied by refugees. Thus the honour bestowed upon Yousafzai has touched many thousands of people, and breathed new life into the campaign for the right to education. Since October 2012, enrollment in the Swat Valley has increased by two percent, according to Swat Education Officer Maskeen Khan. “Now, we are expecting a huge boost after the award,” the official told IPS. Naila Ahmed, a 10th-grader originally hailing from North Waziristan Agency who now lives in a refugee camp in Bannu, feels her generation has been “unlucky”, forced to grow up without an education. The situation is so dire that she views her displacement as a “blessing in disguise”, since the move to Bannu has enabled her to enroll in a private school for the first time in many years. She is one of the fortunate ones; few parents in this militancy-infested region can afford the cost of private schooling, she says. Her words hearken back to the time immediately following Yousafzai’s decision to flee the country, when many from the Swat Valley and its surrounding provinces felt let down by the rising star, left behind to face the Taliban’s wrath stemming from the teenager’s newfound fame. Some agreed with the Taliban’s claim that she had “abandoned Islam for secularism” by accepting an offer to live and study in the UK. In the last few days, however, any ill feeling towards Yousafzai, now the world’s youngest Nobel laureate, appears to have dissipated, replaced by a kind of collective euphoria at the global acknowledgement of her courage. All throughout Swat, girls’ schools distributed free sweets on Oct. 10 and celebrated in the streets. Yousafzai’s former classmate, Mushatari Bibi, explained that the news has been like “a ray of hope” to other girls, who take a big risk each time they leave their homes to head to school. Some even say that the Nobel Prize, and the hope it has instilled in the population, represents a challenge to the very foundations of the Taliban’s power, since more people now feel compelled to stand up to the militants that have plagued the lives of millions for well over a decade.